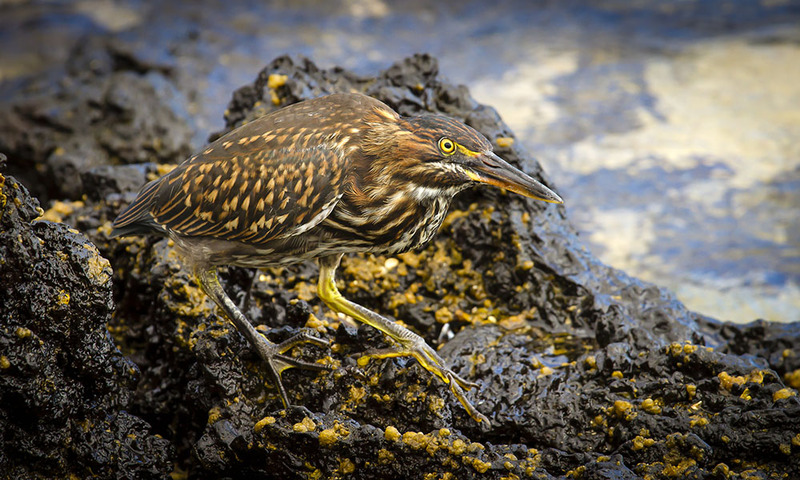 The lava heron is a perfectly camouflaged shore bird of the Galapagos Islands. The lava heron, also known as the Galapagos heron, is a wading bird, endemic to the Galapagos Islands. 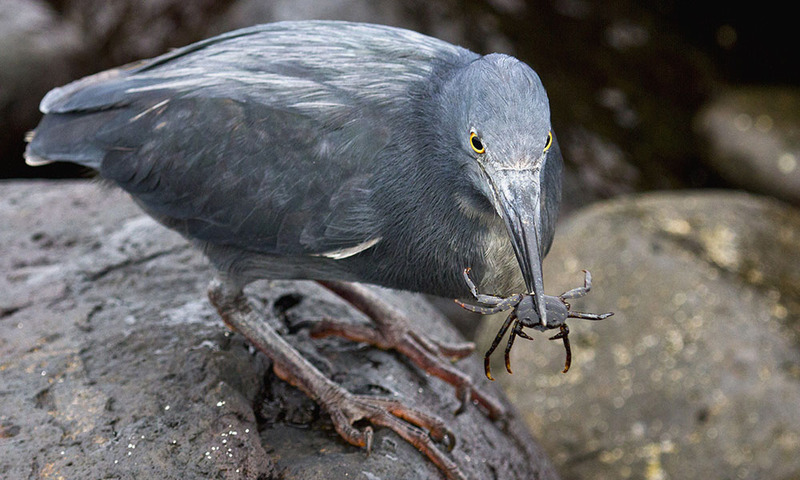 These small herons live and nest along the lava rock coastlines, saltwater lagoons, and mangrove forests. They appear to be common on the Galapagos Islands, but population sizes are currently unknown. They are a uniform grey colour, which acts as camouflage against the grey basalt rocks on which they dwell. They have a short crest on top of their head, and the male birds are slightly larger in size than the females. During the breeding season their legs change from a dull grey to a bright orange, and the bill of the male turns from grey to black. The plumage of the juvenile lava heron is brown and streaky. The lava heron tends to be monogamous and they breed throughout the year, most often after heavy rainfall. The parents build the nest together, within the territory of the male bird, in a spot off the ground in bushes or mangroves. They typically lay one to three eggs at a time and may mate up to three times a year. They feed in the shore zone, primarily eating small fish and crabs, and have been recorded to catch crabs at a fast rate of two to three per minute. To catch their food they move stealthily and then stab at the prey with their sharp beaks. 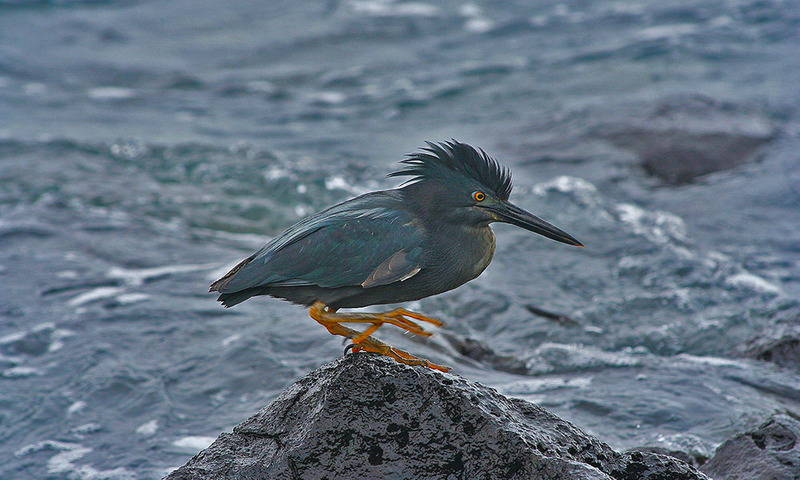 Where to see them: The lava heron is commonly found on all islands in Galapagos, along the shore. When to see them: They nest all year round so they can be seen at any time of year. Threats: Adult lava herons do not have many natural predators but introduced cats are a potential threat. Similarly, invasive species pose the biggest threat to chicks and eggs, as introduced rats and pigs will eat the eggs and hatchlings. Conservation action: Whilst there are currently no specific plans in place in Galapagos to protect them, continual work goes into controlling the invasive species that pose a threat to the lava heron.